Have you noticed people holding their breaths or rubbing their noses in your presence? Do they then shy away from you? these are common problems faced by busy people, particularly, professionals who travel a lot and care less about their personal health than work. The evaporation of sweating from the skin’s surface cools the body to maintain a normal body temperature. Nerves of the sympathetic nervous system control the output of sweat glands to regulate how much sweat they produce. Eccrine glands, found all over the body including the armpits, secrete a watery, cooling sweat. Due to excessive friction of body parts, evolution of bacteria occurs.  Starting at puberty, apocrine glands distributed mainly in the armpit and groin secrete an oily sweat that smells bad when it interacts with skin-dwelling bacteria. An area of the brain called the hypothalamus contains nerve cells that sense the core temperature of the body and the temperature at the surface of the skin. An increase in the basic metabolic rate, as with exercise or exposure to a hot environment, causes the core and the surface of the body to heat up, triggering the hypothalamus to cool the body by activating the sympathetic nervous system. The sympathetic nerves in turn prompt the sweat glands in the armpits and all over the rest of the body to step up their sweat production. Emotional stress and anxiety cause sweating because the hypothalamus, in addition to regulating core body temperature, also works with the adrenal glands to coordinate the body’s fight-or-flight response to stressors. In addition to other actions, this system ramps up basal metabolism to provide extra energy, triggering increased sweating. Emotional stress also prompts release of the hormone epinephrine, also known as adrenaline, which stimulates eccrine and apocrine sweat glands in the underarms. In general, emotion-induced sweating occurs mainly on the palms of the hands, soles of the feet, forehead and underarms. Often emotional sweating is a cold sweat, because it occurs before an increase in core body temperature. The caffeine in coffee, tea, some sodas and chocolate powerfully activates the sympathetic nervous system to cause sweating. If sweating is a problem, cutting out caffeine is recommended by some beauticians. Some medical conditions can cause excessive underarm sweating. The condition known as hyperhidrosis literally means "excessive sweating," much more than is needed to cool the body. In focal hyperhidrosis, excessive sweating primarily occurs in the palms of the hands, soles of the feet, and underarms, while generalized hyperhidrosis causes excessive sweating all over the body. Hormone imbalances -- as in menopause -- can cause hot flashes and sweating. High levels of progesterone, as in pregnancy, can also increase body temperature and trigger underarm sweating. An overly active thyroid gland, termed hyperthyroidism, produces an excess of thyroid hormone. Thyroid hormone increases the body’s metabolism and heat production, ultimately increasing sweating. Wash your clothes everyday. Never repeat the same outfit without washing it first. Body odour always lingers on clothes, and even it you cannot smell the odour at once, other may be able to, especially when it comes into contact with fresh perspiration. This is especially true in the winter. People often don't wash their clothes regularly in the winter and in cold climes since they feel that they hardly perspire at all. In any case, when wearing layers of clothes one feels that there is little chance of any lingering smell. After all, the last thing you would expect to have a smell is your jacket, since it is worn above clothes. But it does smell, so make sure you wash all your clothes, sweaters and undergarments regularly even in the winter. In any case any garment that comes in direct contact with your skin should be washed when you remove it, if you have worn it for an extended period of time during the day. Wearing something sleeveless only makes the smell more pronounced. Try to wear a shirt with sleeves as often as possible. Make it a point to wear an antiperspirant everyday before stepping out. For some people, roll-ons work the best. Cover your entire underarm area with the roll-on. If you tend to sweat a lot, carry the roll-on with you and apply it again during the course of the day. Alternatively, carry a deodorant spray with you and spray your underarms and clothes a couple of times during the day. There is absolutely no reason for you to smell bad. Do you want to smell good, or feel dry, is the question you need to ask yourself when selecting either a deo or an antiperspirant. As the name suggests, antiperspirants block pores and prevent the secretion of perspiration. Hence if there is no perspiration, there is no odour. This action gives rise of theories of health hazards of antiperspirants. Deodorants on the other hand contain antiseptic agents, which kill bacteria that cause odour. Make sure you shower or bathe at least daily, as this will clean your pores of any sweat and bacteria. Also, afterwards be sure to dry yourself thoroughly, especially on areas that are prone to sweat. Dryness will reduce and prolong the development of bacteria which cause odour. Apple cider vinegar is considered as a wonder remedy. It is one of the best replacements for deodorant. The anti-bacterial properties fight off against the bacterial growth. Pour some apple cider vinegar in a bowl. Dip a cotton ball in it and wipe your underarms. This will reduce the pH of the skin, thereby eradicate the armpit odor. Baking soda is an effective remedy to cure underarm odor. Mix one tablespoon of baking soda with one tablespoon of lemon juice. Mix well and apply it on the armpits. Let it rest for some time. Rinse off with clean water. Or else, prepare baking soda paste by adding a little water to it. Apply it under armpits after shower. To get pleasant fragrance, add a few drops of tea tree oil. Lemon can dry out your skin, so apply a moisturizer after using as a remedy if needed. Rub lemon regularly before bath then wash it off. 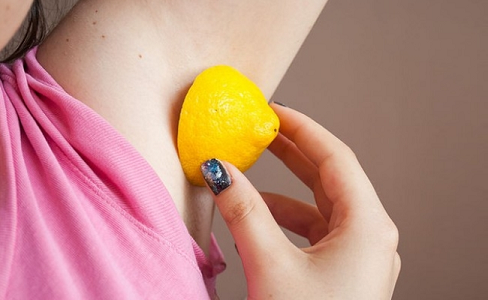 To remove dead skin cells and lighten your underarms, rub a lemon wedge on the skin for a few minutes. Leave the juice on your skin for about 10 minutes and then wash the area thoroughly. Alcohol is another useful remedy to remove armpits odor. To stop underarm perspiration odor, gently rub some alcohol. Application of alcohol on the skin helps close the pores. It evaporates easily and reduces the smell. You can also add some alcohol in a mug of water and use it to rinse your armpits. The most effective of all herbs is Neem. It is blessed with natural anti-bacterial elements. Ayurveda is filled with various treatment procedures using Neem. You can use Neem leaves in warm bath and bath regularly. Rub the water on your armpits and groin area. You will see positive results in few weeks. How to treat underarms odor/armpit sweats with radish? Just extract juice of two dozens of radish. Add some glycerin to it. After mixing well, fill it in a spray bottle. Store it in the refrigerator. Shake it well before use. It will act as a natural deodorant. Crystal rock is also suitable for removing underarm odor and armpit sweats. Crystal rock, made from mineral salt, effectively blocks the sweat glands. It acts as a natural antiperspirant. Use it as a deodorant under your arms to reduce the amount of perspiration. Extract pulp from a tomato and apply it directly on your armpits. Leave it for 15 minutes. Clean it and experience the after effects. To get effective results, practice this remedy for a few weeks. Alum can also be used as a natural deodorant. Pour some water on a piece of alum. Rub it gently on your armpits for some time. It will get dry by itself. Note: Use only blunt side of the piece of alum to rub on the armpits. The mild fragrance of baby powder helps eliminate underarm odor. Apply some baby powder under your armpits to lessen the bad smell. Sandalwood powder is known for its soothing aroma. It is helpful in removing foul underarm smell. Prepare a paste by adding sufficient amount of water in some sandalwood powder. Mix it well and apply it on your armpits. Leave it until it gets dried. Wash with clean water. You can also prepare a mixture by adding white vinegar with some sandalwood powder or oil. After taking bath, apply this mixture on your armpits. The mixture acts as a natural deodorant. Peppermint essential oil is known to fight against odor-creating bacteria. To eliminate underarms odor, take a few drops of peppermint oil in your palm and rub it gently under your arms. Alternatively, prepare a spray by adding a few drops of lavender essential oil in a cup of water. Fill the solution in a spray bottle. Use it as a natural deodorant. 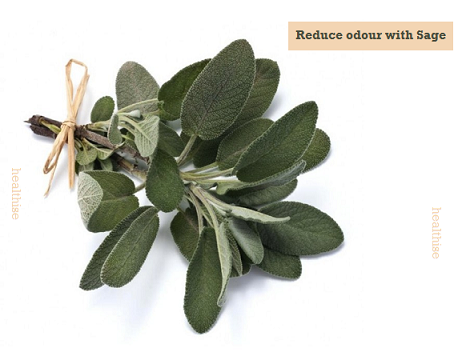 Sage is a beneficial herbal remedy for treating underarms odor. Sage works actively on the overactive sweat gland present in the armpits, thus prevents excessive sweating. It helps remove the underarm odor temporarily. Prepare sage tea. Soak a cotton ball in it and rub it under your arms. After some time, when the area gets dried, repeat the process. Finally, rinse the area with clean water. You can also use diluted sage oil or sage tincture for preventing underarm odor. Ok so there are people who like lots of advice to treat their sweating problem. I have the same thing….first things first, you must shower with an antibacterial soap! This is VERY important. Then you need to find a deodorant that works for YOU! Mine comes from different companies, but you might like your regular ones better who knows, but the first thing is the soap. It made all the difference for me. I change my bathing soap every week. try out new brands. do not stick to one brand. I have tried many brands Sutla papaya. Kojie San. Lux. Dove. Pears. Dettol. Though the article is good. But home remedies do take some time. i want quick fixes. I would suggest you raise your arms as high as possible and walk around. The sweat will evaporate slowly, so do this as much as possible. I came to know about this from my ex. Or you can do what everyone else is does… get some deodorant. You are supposed to put deo at night, right before you go to sleep. When you wake up, there is no need to put any more deodorant. And you sweat minimal to none. Deos are cheap now. OR you can put deodorant and let it dry completely then go. If not, maybe its stress or nervousness. Relax. oh! Some people put lemon juice on their armpits. I hear it works as shown in this informative article. I think the otc perscription strength stuff works? I had a really big problem of sweating so much and staining all my clothes and smelling like 10 minutes after putting on the normal deodorent. Whether a girl or guy, but degree makes a clinical protection for women (and maybe for men too). You only have to put it on once a day.. it actually says at night. I don’t sweat anymore (except of course if i’m exercising a whole lot) and it keeps the smell at bay too. You dont want to actually stop sweating…its bad for you. What I would suggest is deodorant or an antiperspirant. Antiperspirants contain fragrance, but they also contain chemical compounds that block the pores to stop the discharge of perspiration. No sweat, no odor. Deodorant allows the release of perspiration, but prevents odor by combating it with antiseptic agents, which kill odor-causing bacteria. Deodorant is definitely the healthier choice, but if you are desperate you may want to try an antiperspirant, but don’t use it too much because it contains aluminum that is pretty bad for you. If this doesn’t work, and you are still sweating like crazy I would go to a doctor and tell him that you are sweating a bunch, he may have a solution. I actually like smell of body odour a lot and my husband also appreciates it. It is infact turn on for us. Why hate scent of a body given by god!!!! I HAVE THE SAME PROBLEM! i put on deoderant and then sprinkle baby powder on, that helps. What a relief! I haven’t been sweating as much as I did for more than 3 months now. I have thrown all my antiperspirants straight into the trash. Who would have thought it was so simple to eliminate excessive sweating, all without prescription medications. I will be using everything to get rid of the bad smell which my boyfriend hates. The article gives good information. Hyperhidrosis is a medical condition in which a person sweats excessively and unpredictably. People with hyperhidrosis may sweat even when the temperature is cool or when they are at rest. Sweating helps the body stay cool. In most cases, it is perfectly natural. People sweat more in warm temperatures, when they exercise, or in response to situations that make them nervous, angry, embarrassed, or afraid.